Person Finder in Hindi and English to help affected people find missing loved ones. Today, the Google Crisis Response team is opening up another initiative that we hope can assist in the efforts — a Crisis Map for Uttarakhand. This crisis map is only an early version aimed at providing quick information, such as, places affected, relief centers and road closures. As always, in times of such disaster, accurate information is hard to come by and our Crisis Response team has relied on scantily available information where available. For now, you’ll find the following information. We are hoping to add more as we go along. 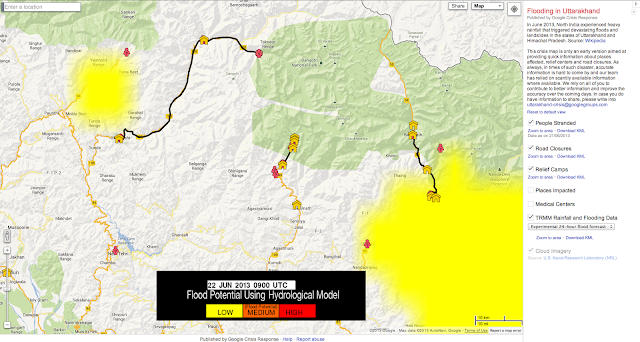 Widespread flood damage continues to ravage Uttarakhand, India and our heart goes out to people who have lost their near and dear ones, their property and assets. Relief agencies are working overtime to bring order and aid to the affected people, and here at Google we’d like to continue providing support in whatever way we can. Just yesterday, our Crisis Response team launched Person Finder in Hindi and English to help affected people find missing loved ones.